WASHINGTON (CNN) -- The Pentagon is considering new tactics in Afghanistan: deploying hundreds of troops using creative and nimble counterinsurgency techniques to fight the Taliban, a U.S. military source told CNN. A proposed plan calls for troops building confidence with local Afghan officials, a source says. The change is based on a plan used in Iraq by Lt. Gen. Stanley McChrystal, who is slated to become the next U.S. commander in Afghanistan if confirmed by the Senate. "We want cohesive units, fleet of foot, specializing in counterinsurgency warfare," the official told CNN. The plan is evolving as Defense Secretary Robert Gates expresses growing concern that public support for the war in Afghanistan will decline unless the Obama administration can demonstrate progress by the end of this year. Pentagon press secretary Geoff Morrell said Gates believes "it's critically important" for both the U.S. and Afghan governments to make progress in the coming months. 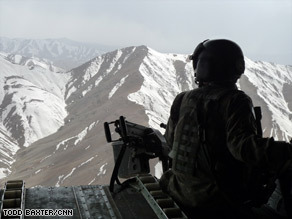 Gates believes the Taliban has momentum in southern Afghanistan, Morrell said. "People are willing to stay in the fight I believe, if they think we're making headway," Gates said in a recent interview with The Wall Street Journal. "If they think we're stalemated and having our young men and women get killed, then patience is going to run out pretty fast." The new idea being considered calls for hundreds, perhaps thousands, of troops to train and deploy as a unique battlefield organization, specializing in counterinsurgency warfare. Counterinsurgency strategies call for military, economic and political tactics to win support of local populations threatened by insurgencies. Those troops could engage in operations ranging from combat to medical care, according to the official, who said the strategy was used to great effect on a smaller scale in Iraq under the Joint Special Command, which McChrystal headed. After serving in the war zone, the units would stay together at their home bases and stay up to date on intelligence from the area of Afghanistan in which they served. When it was time to return to the war zone, they'd go back to the same area -- with the goal being to develop troops with expertise in that particular region, the official said. One complaint the U.S. military continues to hear from Afghans is that troops come to a region, serve a year, and then the Afghans never see them again. This puts incoming troops at a disadvantage in a culture that values ongoing personal interaction. Under the proposed plan, units would build a level of confidence with local and provincial Afghan officials who would come to know them over time, the official told CNN. Under one proposal, those troops would deploy more often but for shorter tours of duty. That could put new strain on military families. The plan also could be difficult to implement and if troops only have career expertise in one area, it could hurt their chances for advancement within the military. The official also said that, under McChrystal, the military will be "stepping up its intelligence game" in Afghanistan, gathering more intelligence on specific insurgent leaders and conducting more reconnaissance and surveillance. The plan has not yet been approved by Adm. Michael Mullen, chairman of the Joint Chiefs of Staff, or by Gates, the source said. But Mullen asked McChrystal several weeks ago to develop a new plan for Afghanistan, a senior military official told CNN. The official briefed CNN on the plan, but declined to be named because the plan is in its early stages and many details are yet to be ironed out.